For those just entering the decorative arts field, the notion of owning and operating an antiques and vintage business can often be a long held dream - usually at the expense of a less interesting day-to-day job that may pay the bills - but which often lacks the allure and exciting potential that can come with the world of antiques and collectibles. When considering this conundrum, the question that is most often raised by people is usually always the same, "How do I transition from what I'm doing... to what I want to be doing?" At first glance, the prospect of opening your own antiques and vintage business can seem somewhat daunting, but once you've acquired the necessary skills and expertise, almost anything is possible. For some, a full-time storefront with added vintage, retro, and mid-century modern items might fit the bill, while for others, an Internet only business might be the perfect niche. Regardless of where your area of interest may lie, there is always one central theme that seems to resonate when it comes to owning and operating a successful decorative arts business, "How do I acquire the right knowledge?" At the AIA, we've spent over half-a-century listening, learning, testing and perfecting our Profit Plans - because like anything else in life - having the know-how to succeed in a particular endeavor is often what sets one apart from the competition. We've gained that knowledge from sharing our own ideas, and by listening to almost 80,000 past graduates over the last fifty years. The training that we impart to our students is not merely based on a theoretical understanding of what it takes to open your own antiques & vintage shop, but instead, is based on the tens-of-thousands of real-world accounts we've received from our students and graduates along the way. Over the last five decades, we've not only adjusted and modified our Course Profit Plans to adapt to the changing times, but we've utilized the invaluable resources of our student database to make those Plans more relevant and profitable than ever before. Today, the opening of an antiques and combination vintage business, can present an entirely different face than it did just ten years ago. There are now a multitude of new sales vehicles and options for dealers, not just on the Internet, but also in the real world. From classic antiques, to 20th century vintage and retro, this changing landscape within the decorative arts community has brought into focus the need for a truly comprehensive understanding of the forces at play within this industry. It is no longer enough to simply open an antiques & vintage shop, pop up a web site, add a blog, create an account on eBay, Instagram or Etsy, and hope to be successful. Virtually every antique store is now on the Internet, advertising their wares not only on eBay and Etsy, but on every other online auction site as well. Dealers and pickers frequently crowd the shows and fairs not only in search of stock, but also for additional customers and clients - thus making the prospect of a truly successful business venture in this field far more difficult without proper guidance and training. 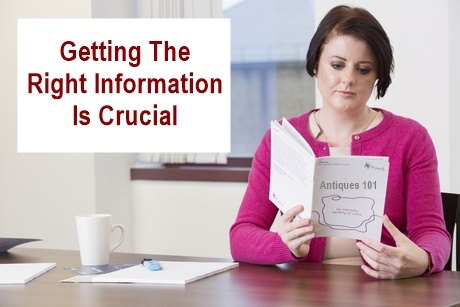 While many of the aforementioned options and approaches to operating and running your own antiques business can be of some benefit to the bottom line, the real trick is in knowing how to correctly apply these strategies into an overall framework for success; including the addition of newly developed sales and marketing techniques, that can also be incorporated into one's business. At the Asheford Institute, our Profit Plans will show you exactly how to do just that. Our Course Plans will describe not only the intricacies involved in selling online, or to in-store customers, but we'll also show you the potential "add-on" services and auxiliary businesses you can incorporate into an overall strategy, in order to make your business more financially robust and flexible within today's antiques and vintage marketplaces. Trying to grapple with the complexities of starting an antiques & vintage business on your own, while an admirable endeavor, can be a daunting and frustrating task. The Internet is filled with contradictory ideas, lessons from beginners, who more often than not, are sharing incorrect information. Small, "How To" articles or books, can be of some benefit, but only if "recently" printed, and with enough substantial information to have a meaningful and tangible effect on your overall business plan. Knowing how to sift through all of this information in order to determine what's of value, and what's not, can be a time consuming and tiring process - especially if there's no guarantee that what you'll end up learning is even going to be correct. That is why it is so important to have a well-tested and proven plan of action in place before one even begins to consider the prospect of opening their own decorative arts business. Not being adequately prepared for what's ahead, is one of the biggest reasons people fail when it comes to owning and operating an antiques business. In this industry, "knowledge" is key, not just knowing how to sell your items, but where and how to buy them as well. Without the correct knowledge to guide you through this process, you're much more likely to end up making the same costly mistakes over and over again - mistakes that could potentially put you out of business - or at the very least, hamper your ability to be truly successful. At over 1,600 pages, and backed by over fifty-years of training experience, the Institute's Profit Plans can help students avoid scenarios such as this by providing them with a proven framework for success. The school's detailed online Course texts cover not only the major areas and categories related to the managing and operation of an antiques & vintage business, but also include innovative ideas and practices that can push one well ahead of the competition when it comes to being profitable. As times have changed, so have the demands and requirements for operating a successful decorative arts business. The Asheford Program has adapted to these changes and has enhanced and developed its Profit Plans to include the latest developments in sales, whether they be online, bricks and mortar vintage stores, or businesses solely created for modern day "picking." The aim of the writers at all times was to design the Asheford Course to be a thoroughly contemporary and comprehensive plan of study for those individuals interested in starting their own antiques-related business. The Program's tested and proven methods for getting results continues to earn high praise from both past and current students, who are themselves, a testament to the success of these evolving strategies and techniques. The Profit Plans offered within the Asheford Course are an integral part of the school's overall curriculum, and are backed by over fifty-years of real-world testing. When it comes time to starting your own antiques and vintage business, you need to ask yourself how much experience and knowledge are really worth... Because while virtually anyone can open up an antiques business, the truth of the matter is that very few actually end up doing it successfully. So, don't end up on the sidelines wondering what went wrong. Enroll today - Risk-Free - and see for yourself how professional-level training from a proven program with over half-a-century's worth of experience can help you succeed! 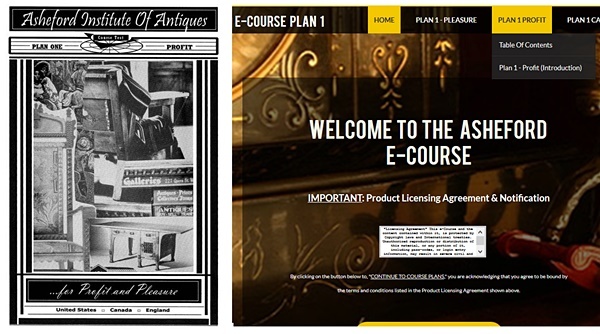 - If you would like to learn more about starting your own antiques & vintage business view our "Course Prospectus"
- Learn about becoming a "Certified" Antiques Appraiser "Become An Appraiser"
- View Course Tuition Payment Plans "Tuition Plans"
- Request a FREE "Hard-Copy Course Prospectus"